ATCAM LLC is dedicated to meet the diverse thermal spraying and traction release coatings needs for our customers. 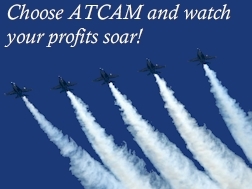 Our modern equipment and facilities, thermal spraying and surface technology expertise, and dedication to complete service and support enables ATCAM LLC to provide customers with the highest quality and most cost efficient solutions to their spraying requirements. 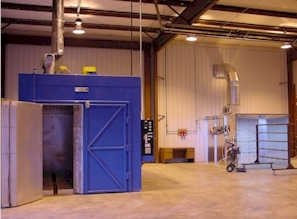 ATCAM LLC is one of a select few companies in the Midwest to offer a complete line of thermal spray coating capabilities. Read more about thermal sprayed coatings and how repairs can be faster and less expensive than new parts Here. The application of hard, wear resistant coatings can extend the life of parts and make them resistant to fretting, friction, galling, erosion, corrosion or abrasion. 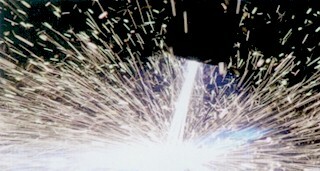 These coatings can be applied to new products to enhance their overall performance during production. 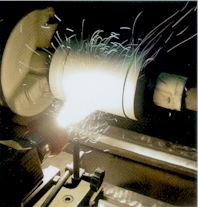 To address specific customer challenges, custom wires with unique chemistries can be manufactured. Corrosion resistant traction coatings are applied on catwalks and stairs used in the food processing and dairy industries. ATCAM's large lathe capabilities allow rolls up to 50 inches in diameter and 50 feet long to be machined or coated. View photo Here. 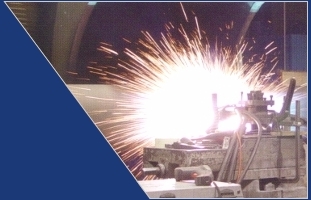 The ability to rebuild worn parts using arc spray technology is an ATCAM specialty and of vital use in situations where replacement parts for older machinery are not available. Whatever your company's individual coating requirements might be, you can rely on ATCAM LLC to provide the technical expertise, application quality, fast turnaround and cost-efficiency your project requires. 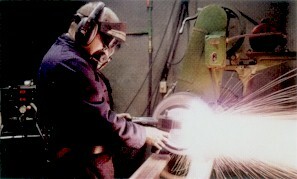 The cell is used for extreme quality coating repetition from part to part. At ATCAM LLC our staff of experienced craftsmen provide coating solutions to a wide range of industries including packaging, paper, food, dairy, mechanical, and etc. 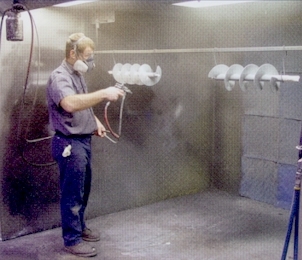 Our state-of-the-art equipment includes a large blast room, 800 degree curing oven and a liquid/powder coating system that allows us to apply such top coatings as Teflon®, Emralon®, Xylan®, and Silicon along with other wear release coatings or specialty coating formulations ATCAM has developed. ATCAM can also supply liquid or powder paint coatings in any color desired. To ensure the finest possible results, ATCAM will analyze our customer's parts to determine the proper requirements for traction/release coatings, low/high friction coatings, corrosion/chemical resistant coatings, etc. View a list of some properly determined coatings Here. Available in virtually any color, liquid release coatings can be applied to enhance component performance in a wide variety of industries. 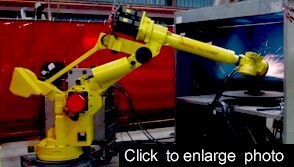 ATCAM has the unique ability to blend metals, ceramics and other materials to acheive the customer's desired coating result. Not only can specific blends be provided, but sizing can also be established to ensure the best surface finish. Powder/liquid coatings are applied to enhance base coatings characteristics. In order to provide the highest quality and fast turnaround required in today's competitive marketplace, at ATCAM LLC, customer's parts can now be treated with the ultimate wear release and/or traction coatings without ever leaving our facility.